CPJ Erasmus & Seun specializes in citrus and bell peppers, the first primarily for export and the second completely for the domestic market. The bell pepper season runs for about seven months, May until December. Their early navels for the domestic market have already been picked. Some lemons and avocados complete the picture (they’ll start exporting lemons next year) but they’re not taking their eye off what the Letsitele Valley is best for: bell peppers, grapefruit and oranges (late Valencias). Grapefruit packing started last week, and in the Letsitele Valley grapefruit producers are packing briskly. Domestically there have been competitive prices for the past two weeks while grapefruit volumes are still low, even exceeding export prices at the moment, says Gerrit Theron, marketing manager at CPJ Erasmus & Seun. They’ve already sent Star Ruby to the Far East and to Canada this season (avoiding Europe and Russia this early in the season), arrival expected in week 18. Usually they also send a substantial amount to Japan and South Korea, but the skin of early grapefruit can’t yet handle cold steri treatment as required by South Africa’s co-called special markets. It is a large harvest and in general sizing looks to have improved on last season, depending on areas. In Hoedspruit sizes are fairly large while in Letsitele it’s a bit of a mixed bag, Gerrit notes. Last year a preponderance of small fruit bedevilled the South Africa grapefruit campaign, leading to an oversupply to the European market. Local juice options could have relieved some of the pressure, Gerrit feels, at times offering better prices than for some of the exported class 2 fruit. It’s still very dry in Letsitele and, very worryingly, the Tzaneen Dam is only 17% full (FreshPlaza has reported before on the impact of the Tzaneen Dam’s reduced capacity on Letsitele). This gives the citrus and vegetable farmers of Letsitele a very slight water buffer with which to enter the dry winter season. 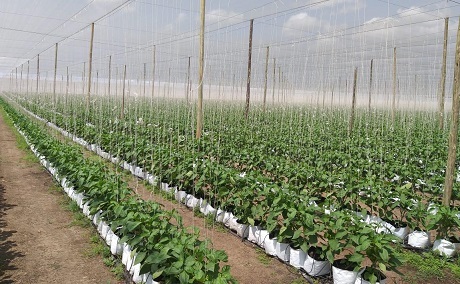 Their pepper production is openland as well as in a hydroponic system in net houses, which brings down temperatures and they didn’t have a problem with too rapid colouration. They market their citrus through Alliance Fruit and Lona Citrus, but starting last year Gerrit has been managing their fledgling own direct marketing channel. A daunting task, he admits, but their first year, with mostly their own fruit, went pretty well.